A team of scientists at the National Metrology Laboratory have cracked the code to reveal one of life’s greatest mysteries; how Santa delivers presents to all of the world’s children on Christmas eve night. The research dubbed ‘the Santa Equation’ demonstrates how Santa travels 1.5 billion kilometres, to visit all the world’s children, in over 900 million homes, in only 31 hours. Luckily Santa has magic and science on his side. After years of painstaking work at the NSAI’s National Metrology Laboratory, scientists have finally made the breakthrough they have long hoped for. 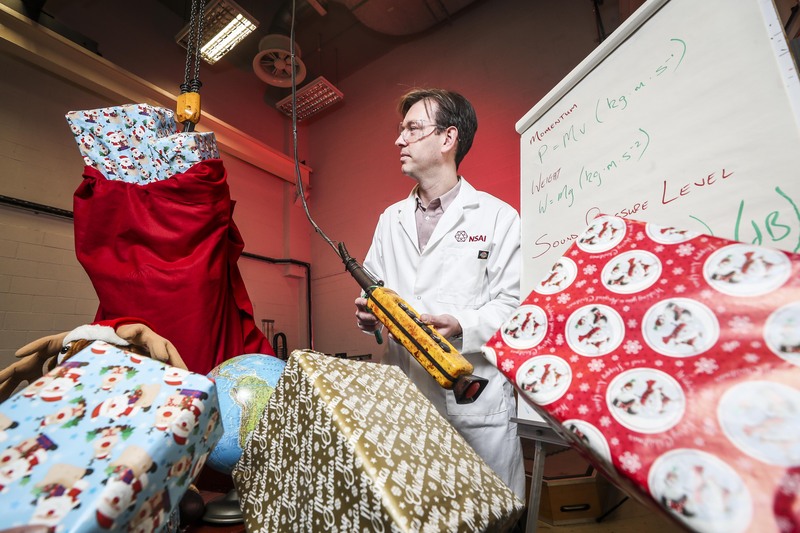 A specially selected team at Ireland’s centre for precision measurement has undertaken the mammoth task of carrying out calculations on the distance, speed and weight that Santa travels on Christmas eve to deliver presents around the world. “We calculated that Santa and his reindeers need to travel at a whopping speed of nearly 45 million kilometres per hour or over 12,000 kilometres per second in order to deliver presents to the world’s children,” said NSAI Scientist and Lead Researcher Dr David Fleming. “If each household has 2.4 children on average, then there are more than 900 million homes to visit. Taking the average distance between homes to be around 1.5 km, Santa needs to cover nearly 1.5 billion kilometres in just 31 hours. Santa has some extra hours to work with thanks to the different time zones and the rotation of the earth, assuming he travels east to west,” he added. Travelling at such speeds also means a lot of noise is generated. This is estimated to be more than 200 decibels, which eclipses even the sound of a rocket launching. Santa, however, uses magic to reduce this sound level to around 20 decibels, when travelling over built-up areas so as not to wake sleeping children. The payload on the sleigh adds another interesting element. The NSAI’s scientists have calculated that if each child gets presents weighing on average 2kg, then Santa’s sleigh will carry over 4 million tonnes. Of course, the sleigh will get lighter as he delivers the presents. All-in-all, quite a feat to accomplish this without fail each year.